All water in the game is updated with new shaders (alpha 0.7e update on Steam). The old water, while more advanced, had numerous issues due to using shader grab passes, which resulted in various bugs and compatibility issues with other semi-transparent objects and screen effects. As the game development progressed, it became a recurring obstacle for implementation of new features. New water doesn’t have real displacement physics and refractions, but it also doesn’t have all the bugs and issues arising from these effects, so it will allow to continue adding new gameplay features instead of spending weeks trying to make the water work without any bugs. 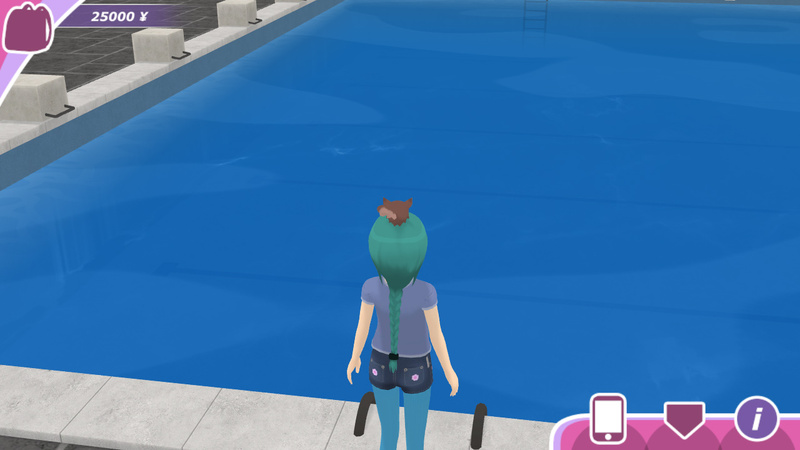 “Water quality” setting is removed from the in-game smartphone, since it’s not used any longer. This water solution isn’t final, and I’ll keep improving it in the future. This update also fixes the collision bug which allowed to crawl through your girlfriend while she was sitting on the ground. 1-2 months. I spent a lot of time experimenting with different water shaders and ideas, which is why the progress with next location (I want to add a new location in update 0.8) slowed down. But now I finally have new water. It turns out in version 0.8 major update. Excuse me, I do not understand English. Yes, 0.8 will be a bigger update. I’m not sure if that’s the question you are asking? Ok. I wanted to hear it. The game is improving bit by bit…… I can’t wait to see more updates in the future. GO SHOUJO CITY!!! !